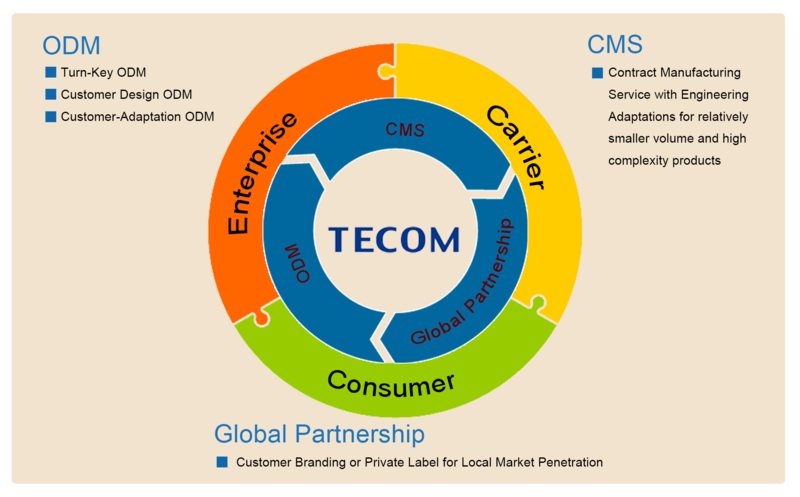 Tecom is built on 3 business models, ODM, CMS and Global Partnership. It applies these models to penetrate the Enterprise, Carrier, and Consumer Markets by providing end-to-end service enabled communication convergence solutions. Tecom always strive to maintain a close cooperation with its partners, from design through to shipping, via dedicated experienced teams. Our expert sales team leaders are continuously on standby, ready to assist our partners and customers. Enterprise – Supplying Business Communications Systems, Smartphone Communication System and Office IP Phones. Carrier – Supplying Broadband Access, Wireless Access and Cloud Service Devices. We host a fully comprehensive range of in-house Testing and production facilities to ensure a zero-error product quality, reliability and performance. With over 30 years experience, we have developed a mature worldwide logistics capability that assures on-time delivery. If you wish to become a partner, please fill out our partnership application form or if you wish to learn more about us, please contact your nearest Tecom sales representative or send your request by filling out our customer inquiry form.